Sections for (1) Papers sent to the PTO—specifications, petitions, arrangement, prior art statement, amendatory papers, etc. (2) Papers received from the Patent and Trademark Office -- return post cards, filing receipts, examiner's actions, notice of allowance, etc. (3) References (4) Correspondence and (5) Copies of drawings. 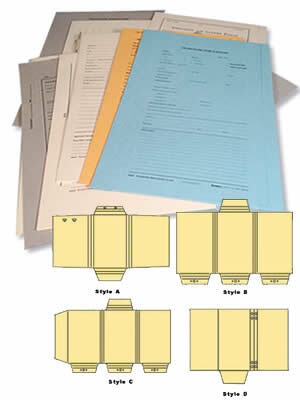 Folders are durable 130 lb. STOCK! Click for information on BlumbergExcelsior Trademark Search and Registration Services.